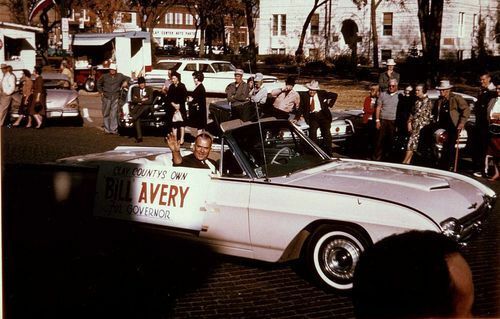 A photograph of Governor William Henry Avery riding in a convertible car with campaign signs on the door in Clay Center, Kansas. He was possibly participating in the Piotique Festival parade which began in 1936 to celebrate the opening of Highway 24 west of Clay Center. Avery was born August 11, 1911 near Wakefield, Kansas, and graduated from Wakefield High School and the University of Kansas. In 1964, Avery was elected the 37th governor of Kansas. He served one term as governor, losing a re-election bid to Robert Docking in 1966.